One of the Leave No Trace principles to minimize impact is Travel and Camp on Durable Surfaces. One of the ways to interpret this is to stay on trails when hiking. As you can see, that is a good idea not only to minimize impact but also to keep safe. I found his little friend of mine along the trail this morning while doing my daily hike. With the three cute little leafs, all shiny and green, he looks harmless enough. No prickly needles or scratchy thorns, but he can cause plenty of trouble if you touch him. 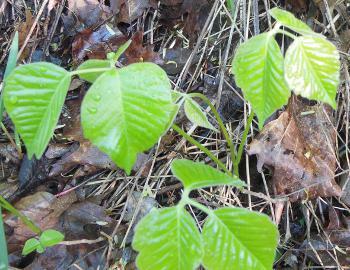 It's the urushiol in the poison ivy that causes skin irritation, more on some people than on others. By staying on the trail, keeping your eyes open, and paying attention to your surroundings, avoiding poison ivy isn't too difficult. When you go off trail, chances of running into it go way up. Actually, just off the trail is one of the best places for poison ivy to grow since it likes wood edges just like the side of a trail, road, or meadow. It takes only a few minutes after contact with poison ivy for the urushiol to absorb into the skin, but it may take many hours for the itching, rash, and blisters to develop. Immediately washing off the contact area with soap and water is your best bet. Clothes that have contacted poison ivy should also be washed. Poison Oak and Poison Sumac are also urushiol-producers and cause similar problems as poison ivy. Burning poison ivy is especially dangerous because inhaling the smoke can effect your lungs.